Ryan McCartan on Ex-Fiancée Dove Cameron: "I Love Her to Death"
Ryan McCartan Talks Engagement Split and "Rocky Horror"
Ryan McCartan isn't one to wallow in sadness. On the heels of his breakup with fiancée Dove Cameron, the 23-year-old actor was in high spirits when he walked the red carpet Thursday at the premiere of The Rocky Horror Picture Show: Let's Do the Time Warp Again in West Hollywood. McCartan posed for photos with co-stars Reeve Carney, Laverne Cox, Victoria Justice, Ivy Levan, Christina Milian, Staz Nair and Ben Vereen, who became like family as they shot Kenny Ortega's homage to the 1975 musical of the same name. If McCartan is correct, fans of the original film should embrace the remake. "Here's the situation: It's the exact same script. Every 't' crossed, every 'i' dotted. I mean, it's literally the exact same script. The characters and the story and what it represents, all of that is still in tact," McCartan, who plays Brad Majors, told E! News' Carissa Culiner. "But it's a brand new cast of characters and it's 41 years later, so you're going to see improved technology, better camera work, better special effects, better costuming with William Ivey Long, a wardrobe legend. You're going to see people who have been a fan of this since its inception." The Fox film will be "different" in other ways, too. "I love what Barry Bostwick did. I'm a huge fan of his; I studied him like nobody's business," McCartan said. "But in the original movie, it feels like Brad and Janet escaped the castle by the skin of their teeth. And in our version, it's almost like, 'Maybe they didn't want to leave. Maybe they kind of liked this Transylvanian lifestyle.' And so that was a fun thing to play with. All of it is in tact. Like I said, the fans who want to see what they want to see are going to see it. Everything beyond that, we took some artistic liberties to change it a little bit, and I think people are really going to enjoy that change." One thing that hasn't changed: the lead actors' chemistry. Justice, who takes over the role of Janet Weiss from Susan Sarandon, was a "wonderful" co-star. "I love her to death. The camera loves her. She's obviously insanely talented. She's just so welcoming and warm. We got along right away, and I think that we did the Brad and Janet story justice—no pun intended. It was just incredible to work with her," McCartan told E! News. "I remember distinctly—and I'll never forget it—on the car ride home from our last day of shooting, I felt myself sort of getting emotional. I turned around and I was like, 'You will always be the Janet to my Brad.' It's a beautiful thing. I'll always cherish the memories from the set." Similarly, McCartan will always cherish his memories with Cameron. Although the Liv and Maddie actress recently ended their engagement after six months, McCartan had nothing but nice things to say about his 20-year-old ex. "I'm good. I love her to death," he said. "There's a lot of love there. You know, she made a decision that—because I love her—I have to respect." "She was there for me while we were filming this movie—we were still together—so I hope she's feeling this energy right now, because it's all happening," McCartan added. "Here we are!" 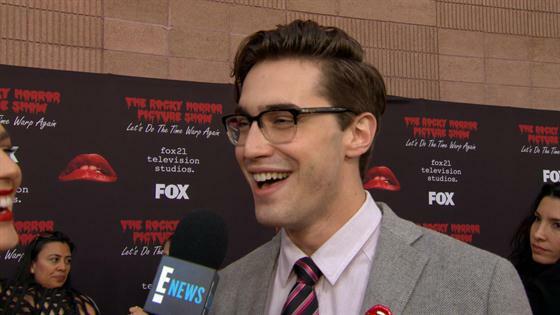 The Rocky Horror Picture Show: Let's Do the Time Warp Again airs Oct. 20 at 8 p.m. on Fox.